Meme makers, start your engines. Bobby, an African gray parrot, imitates the table manners as well as the conversation of his master, John Gillen, of New York City. Grasping a spoon in one claw, Bobby shovels mashed potatoes and strawberry shortcake into his beak in the best society manner. Between spoonfuls, he entertains with table talk. OK Polly, Now hold that spoon steady. Crap! Where did I put my lighter?! 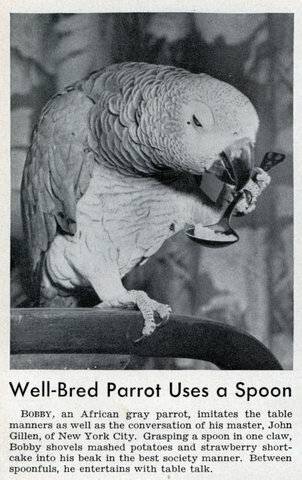 A parrot snorting cocaine, man I miss the 70’s. I will hold this spoon one more time…. Just ONE, and never again.